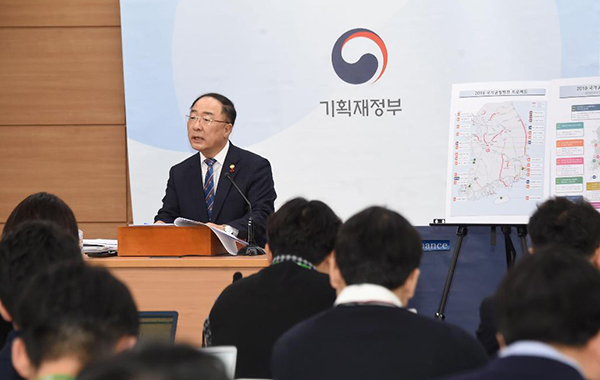 The South Korean government will exempt statutory feasibility studies for 23 infrastructure projects worth 24.1 trillion won ($22 billion) over the next five years designed to modernize the regional parts and balance development gap with the capital region. The government on Tuesday named 23 public investment projects worth 24.1 trillion won including social overhead capital projects worth about 20 trillion won that will be exempt from preliminary feasibility study. They were named after Cabinet members approved the government’s plan to promote balanced national development through investments in public infrastructure such as railway and road business this year and in research and development and airport construction next year. Since 1999, any infrastructure project demanding state budget of more than 50 billion won must go through preliminary feasibility test run as not to waste tax money. 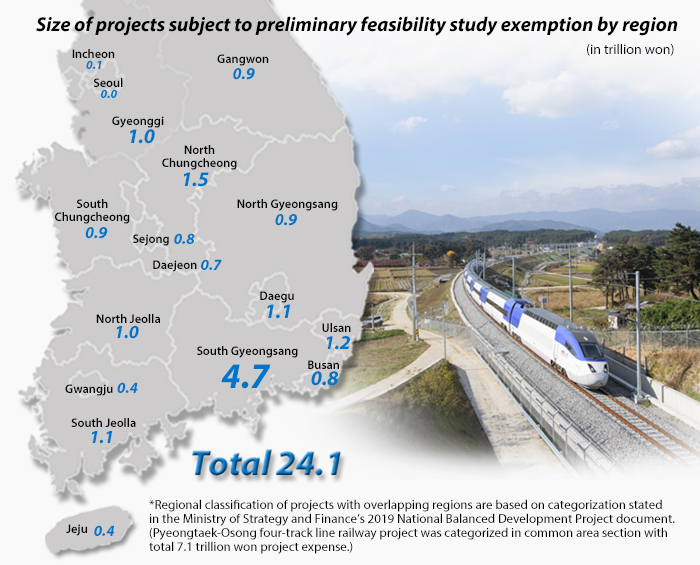 Those eligible for fast-track construction include a railway line that connects Seoul and surrounding areas with inland North and South Gyeongsang Province, high-speed rail addition in the North Chungcheong line, and expansion in the congested sections of high-speed KTX and SRT Gyeongbu and Honam lines. The government will apply exemption to projects mid- to long-term and reflect in establishing national fiscal management for 2019-2024. The government said that the latest exemption plan will allow strategic investment in regional areas that need growth footing amid widening growth gap between capital and non-capital areas. The projects exempt from preliminary feasibility study have been selected among public investment projects with concrete project plans and can be progressed speedily while at the same time contribute to promoting national balanced development and boosting regional economy. The projects were chosen after primarily considering applications from regional governments and also digging alternative ones. The government in particular took notice of regions such as South Gyeongsang and Ulsan, Gunsan in North Jeolla Province, and Mokpo in South Jeolla Province hardly hit by sluggish automobile and shipbuilding industries. The removal of feasibility studies is expected to draw criticism for the government’s turn to pork-barrel projects for makeshift improvement in economic growth and temporary jobs.